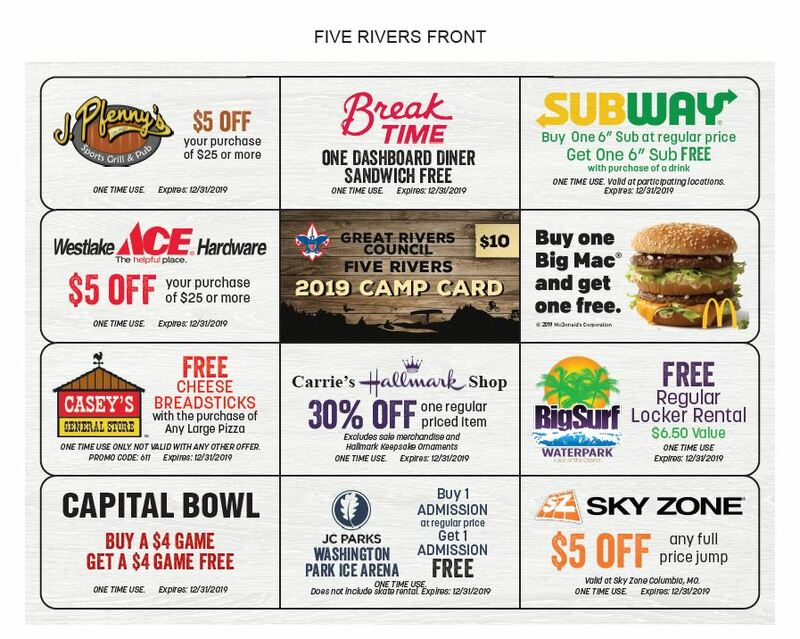 The Great Rivers Council is pleased to announce its 2019 “Camp Card”. This initiative is designed to help Scouts earn their way to a summer/day camp program. Units participating in this program will earn 65% commission ($6.50) on each $10 Camp Card they sell. The cards will be distributed in the districts or available for pick up at the Council Service Center in February. The sale will end June 28, 2019. MORE details to come at your January Roundtable. A Scout is Thrifty....He pays his own way to Summer Camp! This program is RISK FREE, simply return any unsold cards. The Camp Card is designed to help youth fund their way to 2019 Camp programs. This is a Risk Free Unit Sales project where all Scouts can earn their way to Summer Camp, Philmont, other activities or simply support unit program or supplies needs. 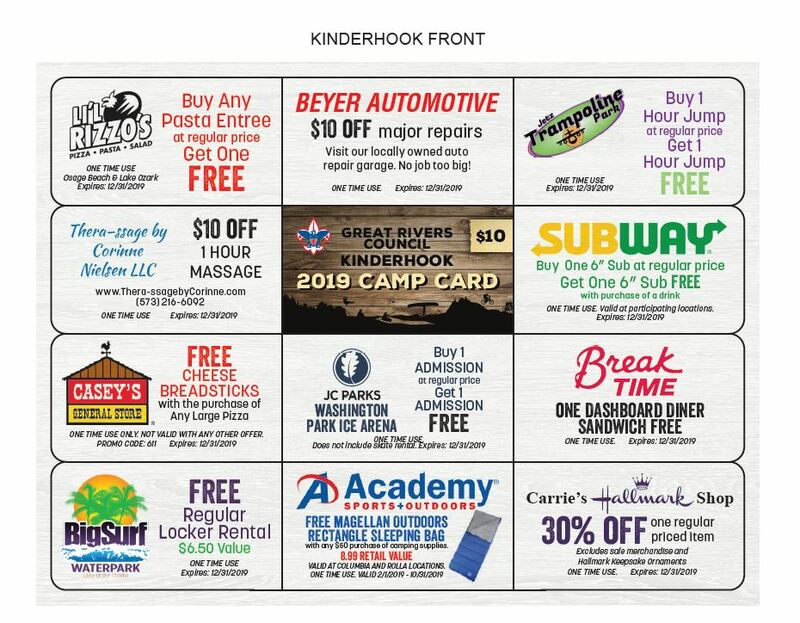 Each Camp Card will sell for only $10.00 to the general public and will have multiple food, service and entertainment discounts for the customer to use throughout the year. The participating unit will keep 50% commission of the sales for each Camp Card sold! 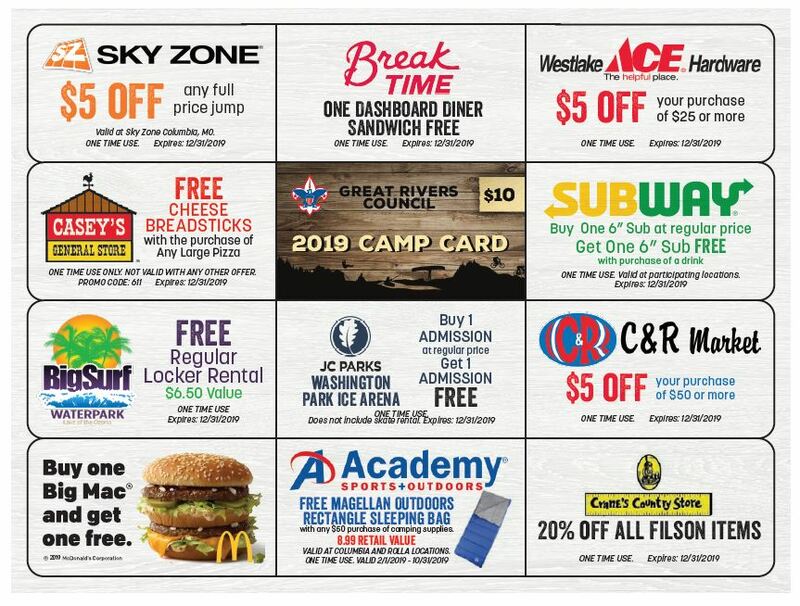 With the discounts, the Camp Card PAYS FOR ITSELF! Commissions from the sales are encouraged to be applied toward directly sending youth to Summer Camp programs, but they may be used as the unit committee sees fit. Units will receive 65% commission for all Camp Cards sold if their accounts are closed out BY JULY 1, 2019. Camp Cards can be returned to the council service center without penalty any time. The cards MUST be in new condition (including snap-off discounts). NO cards will be accepted for return after July 1st. The UNIT is RESPONSIBLE for ANY unreturned cards (lost, misplaced, damaged, etc.) and will be charged $5.00 for partially used cards. Be sure Scouts and parents treat each card as if it were a $10 bill. For more information contact the Council Service Center 573-449-2561.